Kristol vs. Hagel: Why the neoconservative campaign against Obama’s defense nominee has been so effective. The neoconservative’s campaign to stop Obama’s Defense nominee is smaller than it looks, and it might have peaked. But Monday went well for Hagel. Former Democratic Rep. Barney Frank, who wants to return to Congress via the Senate, reversed his noisy opposition to the nominee. Republican objections came off as little off-key, as when Sen. John Cornyn claimed Hagel had left the GOP when he “endorsed” Barack Obama. (Hagel never endorsed Obama, in 2008 or in 2012.) In the new nomination narrative, an aggressive White House was defending a war hero from Republicans who only opposed him out of spite. While it’s a remarkably effective machine, it’s also true that closer you get, the smaller it looks. Allied against Hagel are a relatively small group of D.C. conservatives and hawks, people who’ve been successful in some intra-D.C. fights but got wiped out in the 2012 election. Their strongest weapons against Hagel might have already been deployed, in an effort to spike the nomination while it was still in the embryonic, cocktail-party-chatter stage. But they’re in the thick of it now, framing the Hagel confirmation vote as a test of whether one is for or against Israel, open-minded or anti-Semitic, anti-Iran or genocidal. Who are we talking about? The nodes of the anti-Hagelverse are connected to Bill Kristol. He co-edits the Weekly Standard, founded in 1995, which runs three to six anti-Hagel items every day. He’s on the board of the Emergency Committee for Israel, as is Goldfarb; the nonprofit was founded three years ago and immediately started hitting Democrats with TV ads about their softness on Israel. Kristol is on the board of the Center for American Freedom, which publishes the Washington Free Beacon, edited by his son-in-law, Matt Continetti. 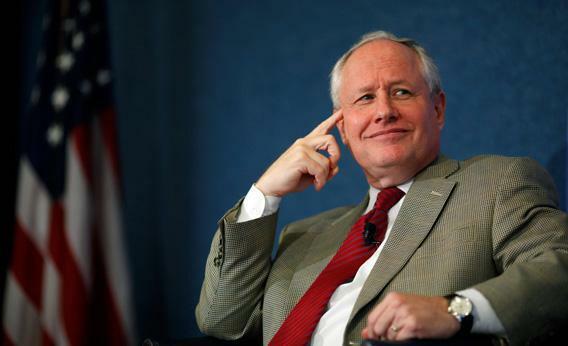 The outposts of “Kristol world,” as Politico calls it, have a combined budget of around $4.8 million. None of this is secretive. Quite the opposite: In December, the same night that “Plan B” went down in the House, the Free Beacon rented two rooms in a downtown D.C. bar for journalists to mingle with staff and get photobombed by the publication’s mascot, the CAF Truth Monkey. Stories and quotes from Jewish leaders, from Abe Foxman to Alan Dershowitz to Ed Koch, percolate throughout these media, into Jennifer Rubin’s Washington Post blog, into Commentary. The pace is intense. In the eight days of 2013, the Weekly Standard has published 30 articles or blog posts about Hagel. Some of them already read silly (“[Chuck] Todd: ‘My Guess Is that They Yank Chuck Hagel at the End of the Day’ ”), but the best of them have been immortalized and shared on the Drudge Report. Many of the hits against Hagel have been around for years, laundered from the time when it was in the Democrats’ interest to portray the senator as an Israel foe. In 2007, when he was talking about a presidential bid, the National Jewish Democratic Coalition issued a seven-point denunciation of Hagel. The key points—that Hagel had waved off letters criticizing the Palestinian Authority’s leaders—were recycled in a Republican memo, which was then posted in full at the Weekly Standard’s website, an item passed around by Kristol’s Foreign Policy Initiative. The anti-Hagel campaign will ramp up now. The Emergency Committee for Israel is looking at more TV ads buys. Ralph Reed, who now runs the Faith & Freedom Coalition, has pre-condemned Hagel; Concerned Women for America is also expected to pile on soon. Any old Hagel quotes that can be characterized as “soft” on Iran or murky toward Israel will be made infamous. Any Democrats who waffle on Hagel, as Maryland’s Ben Cardin and New York’s Chuck Schumer did yesterday, will be made famous. Still, Monday’s nomination revealed the limits of the anti-Hagel campaign. The American Israel Public Affairs Committee, whose annual budget is about 12 times as large as all the Kristol organizations combined, announced that it would stay neutral on Hagel. The Human Rights Campaign, the most politically powerful gay rights group, maintained that Hagel had settled the 1998 “aggressively gay” problem with an apology. The whole split-the-left strategy of focusing on that comment appears to have stalled out, with only the Log Cabin Republicans (aided by some new mystery donors) and the obscure GetEqual beating the drums. GetEqual’s Heather Cronk says she’d “love to hear Chuck Hagel say he’s evolved” in coming hearings, but the White House has already courted and won over groups with a lot more clout. Having done that, and having nominated Hagel, the White House is already working to marginalize the critics. The opposition’s best shot at taking out the nominee was making him so toxic that the administration gave up on him, as it had on Van Jones and Shirley Sherrod. Peter Beinart, in a column backing the Hagel pick, wrote about sitting in a meeting of Democratic foreign policy hands and being shocked at “the degree to which Fox News had gotten inside people’s heads.” That’s still true, but with the Hagel pick, the White House bet that hearings would overwhelm the “freak show”—the attacks on Hagel for declining to sign open letters of support for Israel, or for opposing sanctions on Iran and Syria. The Democrats bet that the anti-Hagel campaign has spent its best ammo already. An anonymous Republican staffer had told the Weekly Standard that Hagel would be proven an “anti-Semite.” Unless some Anita Hill figure emerges, someone who can challenge Hagel’s character with direct quotes, Democrats think that the “anti-Semitism” story will look scurrilous and the hearings will center on Hagel’s actual policies—that his approach to negotiations with Hamas, for example, will stop being portrayed as anti-Israel and start being recognized as a credible stance.